Late autumn is the time when glowing colours really come into their own again. Strong red, rich yellow, warm orange. 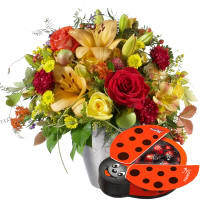 The abundance of colours brings joy and high spirits. 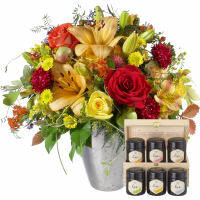 The perfect opportunity for a gift, for example our vibrant October Bouquet of the Month. It’s October. It’s easy to see when we look out of the window. Not only because the light is mellow and visiblity outstanding, but also because of the colours. “This is when Nature develops beautiful shades of red,” says master florist Marc Müller, “and they’re also displayed in this bouquet”. 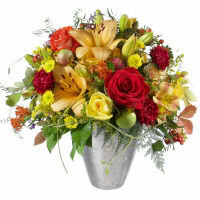 You’d like a little bit of October in a vase? A great idea. For yourself, but naturally as a gift as well.